The most recent study comes from the University of Pennsylvania School of Medicine. Researchers there compared imaging results from 15,633 women who had 3D mammograms to those of 10,753 patients who had just digital mammography in the prior year. This is one of the largest prospective studies of the technology to date. Traditional digital mammography takes images from just two directions, top to bottom and side to side. With 3D, images are taken all the way around the breast creating a series of pictures that radiologists can essentially page through to create a reconstructed image of the breast. When there is a suspicious area, they can look more closely at it to see if it is really an area of concern or just a shadow of sorts created by overlapping tissue that occurs when the breast is compressed. 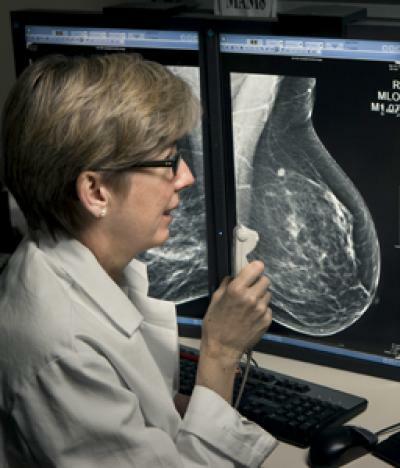 The Pennsylvania researchers found that with 3D mammography, their cancer detection rates jumped by 22 percent, according to the study results released this week at the Radiological Society of North America. Just as important, however, is what they didn’t find. One drawback of traditional mammography is the number of false positives. These are times when women are called in for more imaging because of something suspicious that turns out to be nothing. This can be extremely stressful, and it’s something doctors want to avoid. In Pennsylvania, the false positive rates dropped 15 percent. “Our study showed that we reduced our callback rate and increased our cancer detection rate,” Dr. Emily Conant, the study’s lead author said in a press release. “The degree to which these rates were affected varied by radiologist. But importantly, the ratio of callback to cancer detection rate improved significantly for our radiologists.” The overall positive predictive value—the proportion of positive screening mammograms from which cancer was diagnosed—increased from 4.1 percent to 6.0 percent with tomosynthnesis, a 46% increase.